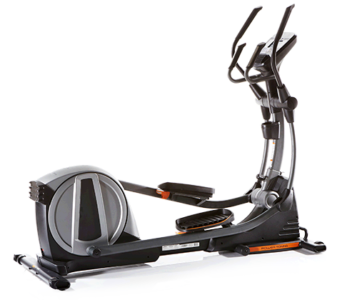 NordicTrack ACT Commercial – Center drive machine with more compact design. What Size Elliptical Trainer is Best for You? Some ellipticals are very compact and some are space hogs, comparable in size to a treadmill. 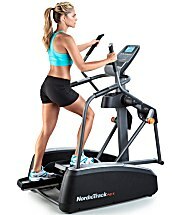 Obviously, it is important to purchase an elliptical that will fit in your house, but you also want a machine that has a natural elliptical motion and is stable. We recommend you avoid the cheap, sub $500 elliptical trainers that you find at mass retailers. Yes, these machines are very compact, but they generally have a short, choppy and unnatural elliptical motion. Since they have such a small footprint and are not very heavy, they can be rather unstable. The instability is most apparent when subjected to a strenuous workout. These machines also have smaller stride lengths, making your elliptical exercise feel constraint. Does that mean you should avoid compact elliptical trainers? Not necessarily. Depending on your available room and budget, a compact elliptical may make sense. And there are several manufacturers that sell ellipticals that are relatively compact, and yet are heavy and stable. They are equipped with rear drives that provide a smooth, natural elliptical motion. ONE recommendation is the Yowza Largo, which is reasonably priced. If you have the budget and the room then consider a regular size elliptical trainer (5’6″-7’6″). It will generally have a “flatter” feel to the elliptical motion. It is more like walking and running, and there is less upswing and kick. It also makes sense that the larger and longer machines will have more stability, and since they are generally priced higher, they tend to be of better quality and more durable. Center drive machines are another option. The can offer the advantage of being fairly compact, while still being extremely stable. They also offer the benefits of close pedal distance and easy step-up mounting. NordicTrack offers moderate price models. Find more options in each category of elliptical with the Elliptical Best Buys page. Also, learn more about buying an elliptical with our Elliptical Buyer’s Guide.